The package was reported at a mail facility on West 52nd Street. A package containing an explosive device addressed to former director of national intelligence James Clapper was found at a mail facility in midtown Friday morning, becoming the 12th bomb sent to prominent Democrats and critics of President Donald Trump across the country this week. A postal worker at the USPS facility on West 52nd Street, between Eighth and Ninth avenues in Manhattan, noticed a package that looked similar to the ones found earlier in the week, NYPD Deputy Commissioner of Intelligence and Counterterrorism John Miller said at a news conference about the Clapper mailing. The devices have all been packaged in manila envelopes, the FBI said. “One postal worker, who, when she saw this, recognized it, froze it in the system, and was able to resolve that before it got delivered,” Miller said. The package was addressed to Clapper, a CNN contributor, at 10 Columbus Circle, where the network has its New York bureau. 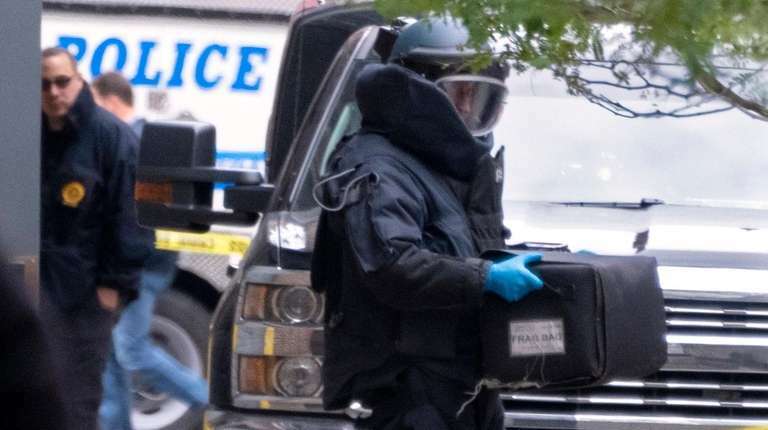 Police responded to the mail facility at about 8:15 a.m. and the parcel was seen being transported into the NYPD’s “total containment vessel” shortly before 10 a.m.
Clapper responded to the threat on the phone to CNN Friday morning. A Florida man was arrested late Friday morning west of Fort Lauderdale, Florida, in connection to the packages, the U.S. Justice Department and FBI said. Cesar Altieri Sayoc, 56, is facing five criminal counts, including threatening former presidents and interstate transportation of explosives, per the criminal complaint filed in the U.S. Attorney's Office of the Southern District of New York. In addition to the package sent to Clapper, 13 others containing improvised explosive devices have been found in several states over the last five days. Among the targets: former President Barack Obama, ex-Secretary of State Hillary Clinton, former Vice President Joe Biden and New Jersey Sen. Cory Booker and California Sen. Kamala Harris. Two of the 13 others were sent to locations in Manhattan. One, addressed to actor Robert De Niro, was found Thursday in TriBeCa, at a building housing his restaurant and offices. The other was addressed to former CIA director John Brennan and delivered Wednesday to CNN's mailroom in the Time Warner Center on Columbus Circle. 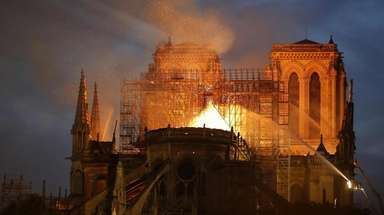 None of the devices exploded and no injuries were reported. 15th suspicious package intercepted in Atlanta: FBISuspect Cesar Altieri Sayoc, of Florida, was due in court Monday. 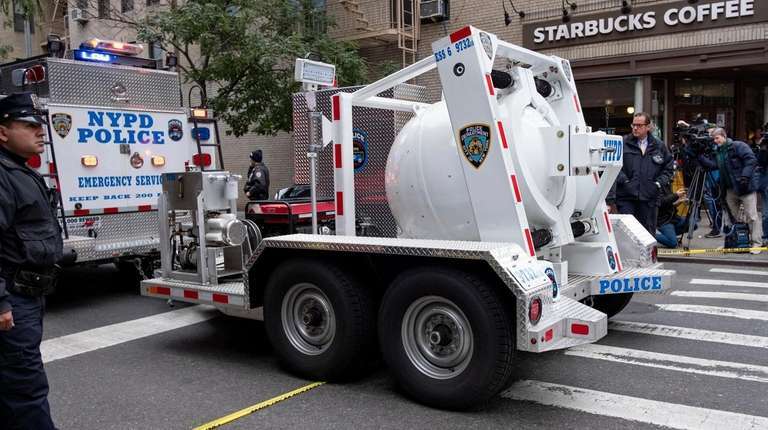 How the NYPD's bomb truck neutralizes explosive devicesThe NYPD has used a Total Containment Vessel three times in as many days. Retired detective alerted NYPD to device sent to De Niro: CopsThe device was similar to those sent to prominent Democrats, the mayor said.